These Free Chlorine Test Strips 486637 are used in the Sensafe Exact Micro 7 Photometer and in other water testing micro meters. Spa and Swimming pool owners should test for free chlorine in pool water regularly to ensure their free chlorine level is in the proper range of 1.0 - 3.0 ppm. When the free chlorine or residual chlorine in pool water exceeds this amount, it can irritate the eyes, nose and skin. If the free chlorine is too low, it may result in the growth of algae and bacteria, which can make your water unsafe and cloudy. 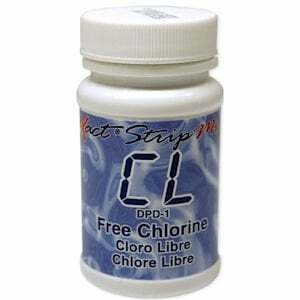 *The DPD-3 Total Chlorine strips that came with the eXact Micro kit require the use of a DPD-1 strip to test for free chlorine, whereas the DPD-4 strips do not.